Bernardino Cardinal Echeverría Ruiz, O.F.M. The unexpected news of the death of Plinio Corrêa de Oliveira has moved us to ponder some chapters of his life and to reflect that the more intense the evils of an epoch, the more exceptional are the figures Divine Providence calls to face them. It is a reflection on His design to fight crises, calling souls of fire. It happens that such souls are victims of the most passionate and unfounded attacks, which attempt to silence them and illustrate the obstinacy that often pervades the spirit of some classes of men. When the figures are truly great, however, their adversaries neither bring them down nor silence them, for their unfair attacks ultimately emphasize — against their wishes — the qualities of those elect souls. This is what happened with the Divine Savior: He was attacked, reviled, and martyred by His executioners, but His light, despite the efforts of so many to destroy it, will shine in His Church until the end of times. Christianus alter Christus — the Christian is another Christ. Something analogous happened with Plinio Corrêa de Oliveira over the decades until his recent and regretted death. It was difficult to mention his name in recent times on our continent and even in the greater part of the West without unleashing applause and admiration on one side and, on the other, true verbal storms, always so sodden in passion and so devoid of basis. In the 1940’s, when Nazi-fascism was in fashion and when many in Europe and America wavered before it, Plinio Corrêa de Oliveira’s pen courageously denounced the neo-pagan, socialist, and gnostic imposture inspiring that aberration and thereby preserved many Catholic circles from its unhappy influence. Now that attacks on Nazi-fascism are commonplace — in part because errors having a minimal following are easy to excoriate — one not infrequently finds its accomplices of yesterday among its pretended enemies today. These continue to silence or calumniate Plinio Corrêa de Oliveira, who clearly and courageously criticized that fraud when it was close to dominating the world. After World War II, history turned around. Many of the old followers of Nazi-fascism, becoming its adversaries, now looked toward Marxism with their same propensity to compromise with mortal enemies. Communism thenceforth made momentous progress in the whole world, to the harm of tens of millions of victims. Once again, and for decades, Plinio Corrêa de Oliveira remained steadfast in the trenches of the polemic against communism, socialism, and its collaborators while the Revolution relentlessly promoted that aberration everywhere. Unfortunately, Catholic circles, which had not been immune to Nazi-fascist infiltration, did not escape that of Marxism either. Rather, there are numerous examples of grave complicity with that error and abusive fury against those who attacked it. Obviously, Plinio Corrêa de Oliveira’s position was not merely anti-Nazi or anti-communist. Rather, these stands grew out of an entirely consistent and notably fervent Catholic doctrinal position in defense of all the principles of the Church, especially those harmed by Her most bitter enemies. His first concern in the apostolate was apologetics, desiring that the Church be served by logic and doctrine in all their vigor. Even in his youth, more than half a century ago, he published In Defense of Catholic Action, a book that pricks consciences yet today. For this he received the warm congratulations of Pius XII, sent on his behalf by Monsignor Giovanni Battista Montini, then Substitute Secretary of State, and, decades later, elevated to the Pontifical throne as Paul VI. The book produced enthusiasm in some and irritation in others, for it denounced errors germinating in Catholic circles that were being met with indulgence by some and with indifference by others. But Plinio Corrêa de Oliveira saw — as history has confirmed — seeds of a great future crisis in the Holy Church. Considering recent history in retrospect and recalling his clear warning and the veritable cataclysm, not yet passed, that shook the Church in the last decades, we must exclaim: Ah, if only that voice had been heeded! In truth, it is unnecessary to have great wisdom or zeal to see the danger from the powerful and obvious evils, but both qualities are indispensable for seeing the potential risks when they are just being born. Plinio Corrêa de Oliveira knew how to see the dangers from afar and to denounce them, taking care especially to reveal the most hidden of them — even though he would suffer for doing so since those attitudes frequently frustrated the plans of the Church’s enemies. His desire was that the teachings of Our Lord Jesus Christ deeply imbue contemporary society, according to the motto of Saint Pius X, “Omnia instaurare in Christo,” which so touched the Catholic world at the dawn of this century and has since inspired the action of the best apostles. His book Revolution and Counter-Revolution, published in 1959, analyzes the history of the last centuries and the situation of the contemporary world, showing that a process has corroded Christendom, fights to destroy its remains, and seeks to establish a regime opposed in everything to the Law of God. In the face of that process, the authentic Catholic — as Saint Paul points out — cannot conform with the present century and the situation of the contemporary world (Rom. 12:2); he cannot wish for a modus vivendi between the Church and the tendencies dominating the world, but should desire for it and for Christian civilization a full strength and a brilliance even greater than in the best years of their history. The Catholic faithful should thus fully apply the wise and severe sentence of Our Lord that no one can serve two masters. It was for this reason that Plinio Corrêa de Oliveira dedicated all the energies of his long and fruitful life to the dauntless fight against that process, to the re-Christianizing of the temporal order along the ways of the Reign of Christ, to the Reign of Mary. His last book, Nobility and Analogous Traditional Elites in the Allocutions of Pius XII — which we already had the opportunity to praise — appeared several decades after the last speeches of the much-missed Pontiff, ransoming them from the deep oblivion in which they had been left and showing how much good they could have done to the contemporary world had they inspired religious and lay leaders. His work spread to 27 countries — including Ecuador — where the fighting zeal of the master kindled idealistic enthusiasm in his disciples, stimulating their piety and orienting their studies and action at a time when doctrinal errors, religious indifference, self-interest, and the obsession to compromise with the worst situations are becoming increasingly frequent. It remains that we ask the Most Holy Virgin, who has called to herself him who dedicated his life to her, to bless the future continuity of his work, especially as current events presage more crises and conflicts. It is indispensable to have her maternal help to avoid and vanquish them, as the life of Plinio Corrêa de Oliveira shows. Bernardino Cardinal Echeverría Ruiz, O.F.M., was born in Cotocachi, Ecuador, in 1912. Taking the Franciscan habit in 1928, he was ordained in 1937. In 1941 he received his doctorate in philosophy from the Pontifical Institute Antoniano in Rome. He was appointed bishop of Ambato in 1949 and served there for twenty years until being named Archbishop of Guayaquil, which see he held from 1969 to 1989. He was successively elected as Secretary, Vice President, and President of the Ecuadorian Conference of Bishops, and remains as honorary president and representative of that body to the Latin American Episcopal Conference (CELAM), of which he is a co-founder. He was honored with the title of Assistant of the Apostolic See. During the consistory of November 1994, John Paul II named him a Cardinal and titular of Saints Nereus and Achilleus. Cardinal Echeverría died on April 6, 2000. 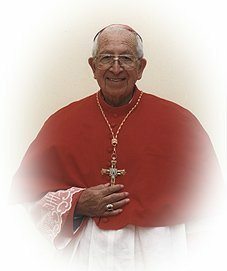 Bernardino Cardinal Echeverría Ruiz, “Distinguished Apostle, Ardent and Intrepid Polemist,” translated from an article published in El Universo, Guayaquil, Ecuador, Nov. 12, 1995. 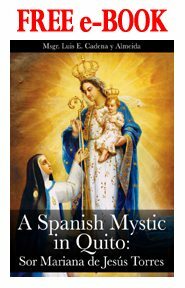 For the Spanish text of this article, please click here. 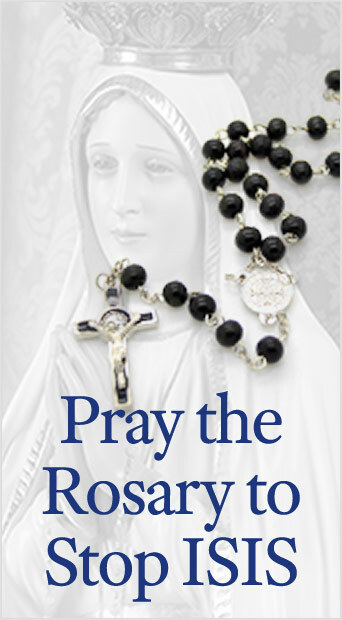 This entry was posted in Catholic Perspective, News Commentary, Who We Are and tagged Achilleus, Action, Allocutions, alter, America, Apostolic See, Ardent and Intrepid Polemist, bishop, Cardinal, Catholic, CELAM, Christ, Christianus, Christus, communist, conference, Correa de Oliveira, crisis, Defense, Diocese, Divine, doctrine, Echeverria Ruiz, Ecuador, epoch, Europe, fascist, Franciscan, gnostic, God, John Paul II, Law, life, martyr, Marxism, Mary, Montini, Nazi, nobility, Omnia Instaurare in Christo, Paul, philosophy, Pius, Plinio, Plinio Corrêa de Oliveira: Distinguished Apostle, polemist, Pontifical Institute, Providence, Quito, Reign, revolution, Rome, Saint, Savior, Secretary, socialism, socialist, soul, State, times, Traditional Elites, victims, Virgin, War, world by Bernardino Cardinal Echeverria Ruiz. Bookmark the permalink.